This month’s Daring Bakers’ challenge (hosted by Audax Artifex) was the mighty scone (aka biscuits in North America). I was rather happy with this challenge as I’m fairly comfortable with baking scones and we were well and truly due for a batch in the house. I also had a fun idea I wanted to try out which was the addition of Manchego (a hard, Spanish sheep milk cheese) in the scones, paired with some homemade cherry jam. 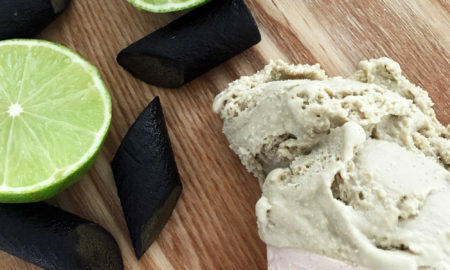 A rather tasty international marriage, no? To the uninitiated, scones may sound like they belong in Baking 101 and there’s no real trick to making them, but as contestants of Australian MasterChef 2010 sadly discovered, scones do take a reasonable amount of practice and experience to get right. Even in an ideal environment (MasterChef contestants were baking outdoors), scones can fail to rise, end up doughy or be akin to ice hockey pucks. As I’m sure Audax would attest, there are many, many, many recipes for scones. Some call for secret ingredients such as lemonade whereas others insist on cold grated butter. 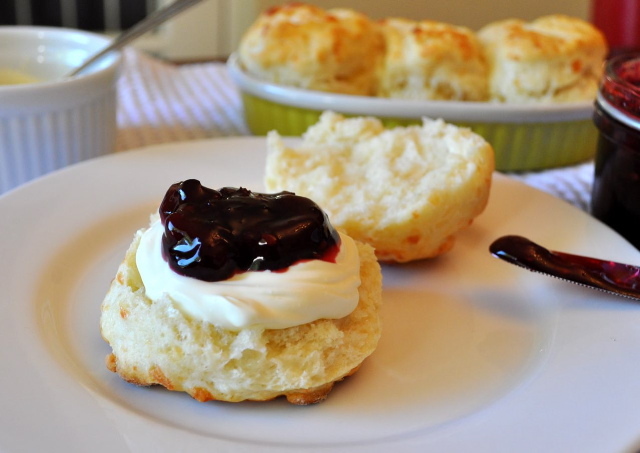 I generally used a recipe that required butter (as per my first ever scone experience in high school home economics) but when I discovered the Country Women’s Association’s (CWA) super simple recipe (CWA Scones – Fool proof!) a few years ago, I never looked back. I tried to be open-minded about using other recipes for this challenge but with an expensive chunk of Manchego at stake (I managed to get some at $75 per kilo, which is not the most expensive I’ve seen it sold for), I decided to go with what I knew best. 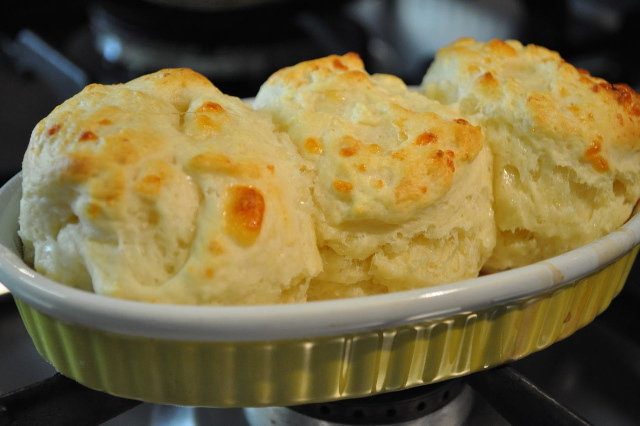 I am looking forward to trying the buttermilk recipe some time soon though :) The amount of Manchego to use in the original scone recipe is up to your taste but I recommend 1/2 cup of grated cheese to the 3 cups of flour. A week prior to baking the scones, I got my Thermomix out to make some cherry jam to accompany the Manchego scones. 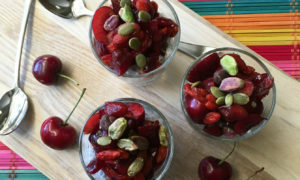 I used a blend of 200g of black cherries and 50g of blackberries for a bit more acidity without overpowering the cherries. I threw in a small chunk of lemon, citric pectin (I prefer this to jam setter) and a dash of Pedro Ximenez since we were going with a Spanish theme and let the TMX make me some jam. The end result was a delectable dark jam full of whole fruit with a subtle taste of the raisiny sherry. The jam worked really nicely with the Manchego cheese scones along with a dollop of creme fraiche. 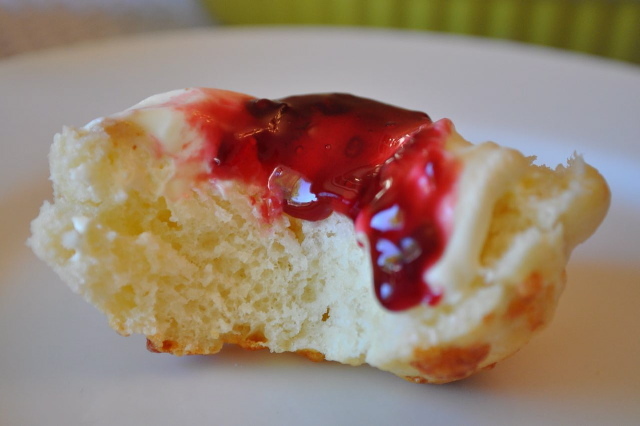 I just love the CWA scone recipe as well, yours look perfect and the cherry with the Manchego sounds do delicious a wonderful effort and result on this challenge. Cheers from Audax in Sydney Australia. Wow you got me at Manchego Cheese. Sounds amazing! 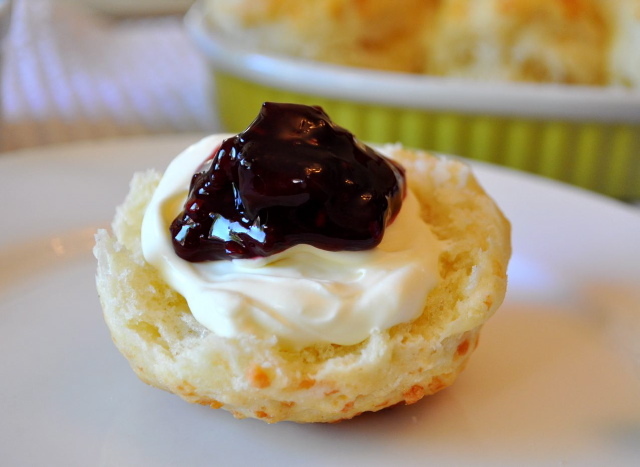 Manchego scones sound awesome, and they look perfect with the cherry jam. Great work!